Astronaut Drew Feustel, left, is aboard the International Space Station as actor Will Smith, right, holds the world's first Instagram Live streaming interview with a space traveler. 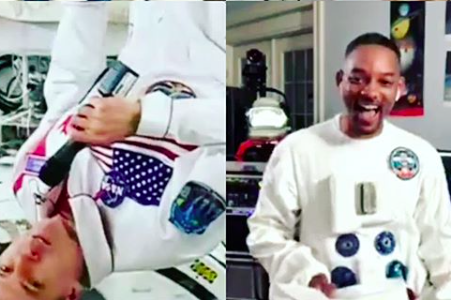 Will Smith has been on Instagram for less than a year and he's already a pioneer of platform. On Friday morning, the West Philly native held the first-ever Instagram Live streaming interview with an astronaut in space. The event was sponsored by NatGeo, which produces Smith's new "One Strange Rock" series about the mysteries of planet earth. Taking Smith's questions — many of them submitted by fans — was astronaut Drew Feustel, a flight engineer for Expedition 55 of the International Space Station. As you might expect from a combination of Will Smith's mind and crowdsourced questions, the conversation touched on topics from the bathroom to the bedroom. Feustel, whose mission includes helping researchers collect samples, did his best to handle them with grace and humor. The most eye-opening aspects of the nearly 20-minute conversation involve the lifestyle Feustel and his fellow astronauts grow accustomed to in space. It takes them just 90 minutes to travel around the planet, so they see 16 sunrises and sunsets every day. "I think there are very few astronauts that wouldn't say that we wish that every human being could see with their eyes — not just pictures, but with their own eyes — what the earth looked like from space," Feustel said. "And I personally think it would change us as a species. It would change us and make us all realize that Earth is really a spaceship."